PDF Expert 2 goes beyond the capabilities of the built-in macOS Preview app, with the ability to edit PDF text, adjust or replace images, all links to text, and much more. Readdle’s PDF Expert ($60 on the App Store) is a fast, slick document viewer with annotation tools that gives Apple’s Preview a run for its money. While the built-in Preview app can handle basic annotation, PDF Expert 2 lives up to its name with stamps and other advanced features. With the release of PDF Expert 2, Readdle not only delivers PDF editing, but it also comes surprisingly close to feature parity with the reigning PDF heavyweight, Adobe Acrobat DC. Want to add links or redact text inside a PDF document? No problem. Need to keep PDF files from potentially prying eyes by protecting documents with a password? Consider it done. By far the most impressive new features are the ability to edit text and images. Whether fixing a last-minute typo or swapping out a company logo, PE2’s slick user interface makes it a snap, although the tools are fairly basic. I successfully replaced one image from a magazine article, but couldn’t match the 20-degree angle of the original; the rotate tools only work 45 degrees at a time. Need to make a last-minute change to your text? PDF Expert 2 for Mac makes it a snap to edit text right inside your PDF files. Readdle managed to add this functionality and still run circles around the performance of Preview, which has always been notoriously slow to launch or open files. By comparison, PDF Expert 2 is greased lightning. It’s so fast, I’ve made it my default application for all PDF files. When it comes to advanced features, Acrobat still has the upper hand for now. Power users who need optical character recognition or frequently convert between PDF and text files like Microsoft Word will find PE2 lacking; tools to optimize scanned pages or reduce the size of PDF files are also absent. Whether it’s replacing a logo or resizing images, PDF Expert 2 makes it easy to do on the Mac. Editing may be the star of PDF Expert 2, but there are welcome improvements to the existing annotation lineup as well. The biggest is Stamps, which allow users to markup documents using virtual imprints; a wide variety are included, but you can also create your own. The crop tool also comes in handy, offering the option to trim just the current page, or an entire document at once. Readdle addressed my second-biggest complaint about the previous version by enabling users to import images to use as a signature, in addition to existing keyboard and trackpad methods. You can even use Apple Pencil to create a new signature on iPad Pro, which syncs back to the Mac as well. Speaking of working together, PE2 supports Handoff, but the built-in Readdle Transfer provides a better way to transfer files between devices. (It’s the only option for those who purchase outside of the Mac App Store.) Open a document on the iOS version while PDF Expert is running, and a little blue icon lights up on the toolbar next to the Share button. Use the pulldown menu to select the document, and it instantly opens on the Mac. This feature also works the other way around, and more reliably than Handoff. 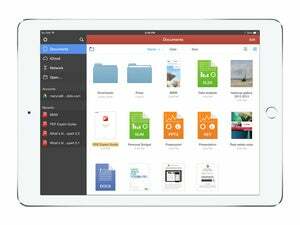 Lock up your PDF files with a password, one of the many new features in PDF Expert 2 for Mac. While PDF Expert 2 is more affordable than competitors like Adobe Acrobat DC or PDFpen, the price also increased accordingly; owners of the first version (originally $20) receive the update free of charge. Based on Readdle’s track record, I’m confident the third chapter in the PDF Expert saga will check off most of the remaining items on my wish list. Faster than Preview and nearly as feature-packed as Adobe Acrobat DC, PDF Expert 2 is proof sequels can be superior to the original in every way.